We’ve released a new update for CIA World Factbook for BlackBerry® & Android™. The new update fixes minor bugs and improves the performance of the application greatly. CIA World Factbook 2013 is based on the latest information provided by the Central Intelligence Agency of the United States of America. With detailed information on over 270 countries CIA World Factbook 2013 is the perfect application for students and travelers alike. Look up information on culture, economic, climate and much more with just the click of a button. 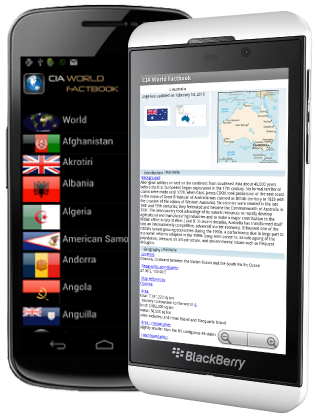 CIA World Factbook is compatible with BlackBerry® 10, BlackBerry® Legacy OS, BlackBerry® PlayBook™ and all devices running Android™ 2.1 and up.